Comm Eye Health Vol. 30 No. 98 2017 pp 34-36. Published online 07 September 2017. Research Fellow and Public Health Optometrist: International Centre for Eye Health, London, UK. Assistant Professor in International Eye Health: International Centre for Eye Health, London, UK. Co-Founder & CEO of The Peek Vision Foundation and its trading subsidiary, Peek Vision Ltd.
School eye health programmes provide a unique opportunity to positively influence the health of 700 million children globally. The impact of school eye health (SEH) goes far beyond good vision— it encompasses education, social development and economic productivity. In all school eye health programmes, there are usually a number of factors which limit implementation, which can include a lack of trained personnel for screening, accurate diagnosis and acceptable treatment. The availabiliy of appropriate and affordable spectacle frames and lenses for children with refractive error, and access to specialist treatment for diagnosis and management of other eye conditions, are important resources that need to be accessible. New technology and innovative medical devices and software can be used at many stages in school eye health programmes. These innovations can make the programme more efficient and effective and can offer benefits to those running the programme as well as the children receiving care. Health education for children, parents and teachers. Each task in a school eye health programme can affect the quality of care provided. Below, and in Table 1, we summarise some of the challenges and outline new developments that could assist in improving the quality and delivery of comprehensive school eye health. The list is not exhaustive and only gives a few examples of what is currently available. These are crucial elements of a school eye health programme. Depending on the skills and qualifications of personnel available, these can be either two separate stages or be combined. To assist in an eye examination, low cost ophthalmoscopes are now available, including Optyse and ArcLight. These can also be used as torches to examine the anterior segment. 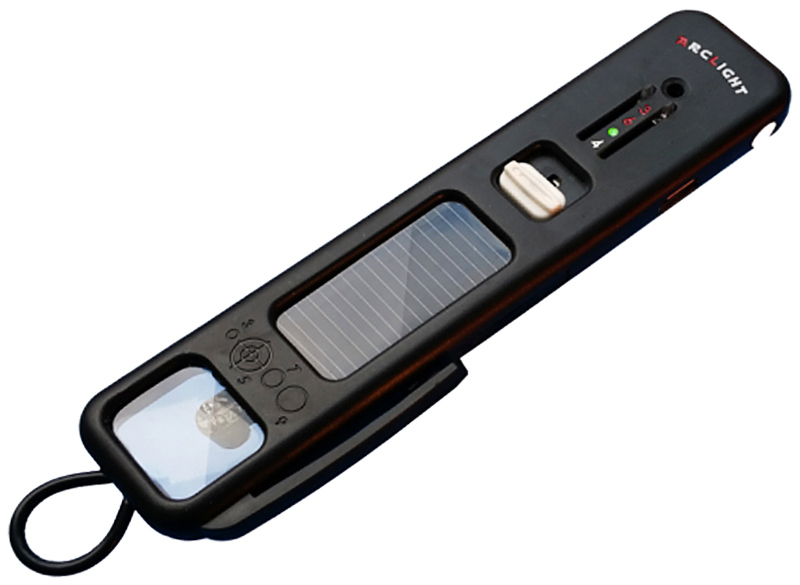 ArcLight (Figure 2) has a solar panel to recharge the battery. Read more: http://arclightscope.com/features/. Initial assessment of the refractive error using an auto refractor (such as SmartVision or EyeNetra) can help to speed up refraction, but it is essential that this is followed by comprehensive refraction by a skilled practitioner. Dispensing and delivering spectacles pose further challenges, particularly when it comes to the availability of high-quality spectacle frames that are affordable,acceptable and appropriate for children (see article on page 33 for innovations in spectacles for children). The following children need to have a detailed eye examination, including examination of the posterior segment: those with strabismus, corneal opacities, or high degrees of refractive error, and those for whom visual acuity does not improve to normal with refraction. Low-cost ophthalmoscopes, such as ArcLight or Optyse, can also be used for this purpose. After identification, these children need to be referred for further examination as appropriate, e.g., for routine/urgent ophthalmologist review or cycloplegia refraction. The final stage in the process is health education of parents/carers, as it is vital that they know about the results of the screening and eye examination of their child, and the action required. This is usually done by giving the child an information sheet or pamphlet to take home for their parents, but this can be challenging where many adults are not literate or where multiple languages are used. Software, such as the Peek School Screening System, can address this by sending SMS or pre-recorded voice messages to parents/carers. 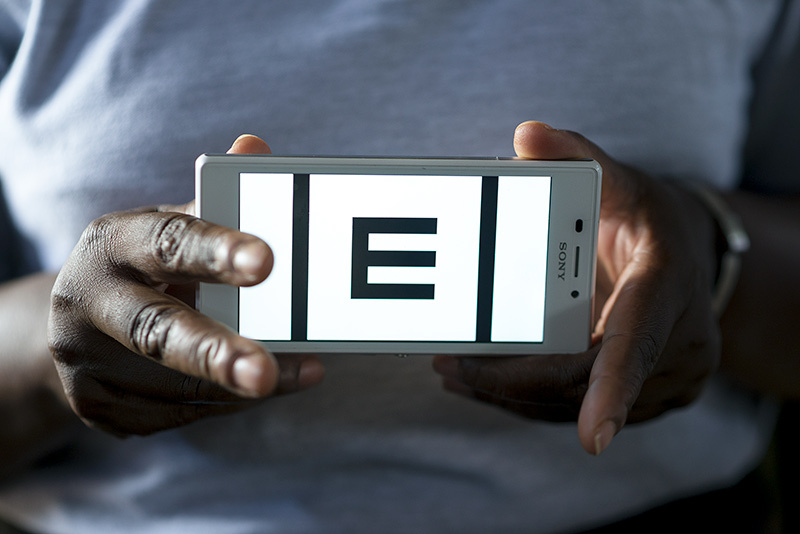 Peek can also generate photographs which show how the world appears to a child with uncorrected refractive error (simulation images), which can also be sent to parents. Management information system (MIS) software, such as Orbis’ REACHSoft, capture data for planning, implementation, and monitoring of field activities. The data generated can then be analysed and used to better understand local service delivery challenges. Another example of a MIS system is the Peek School Screening System (Figure 3), which works in tandem with the Peek Acuity App. 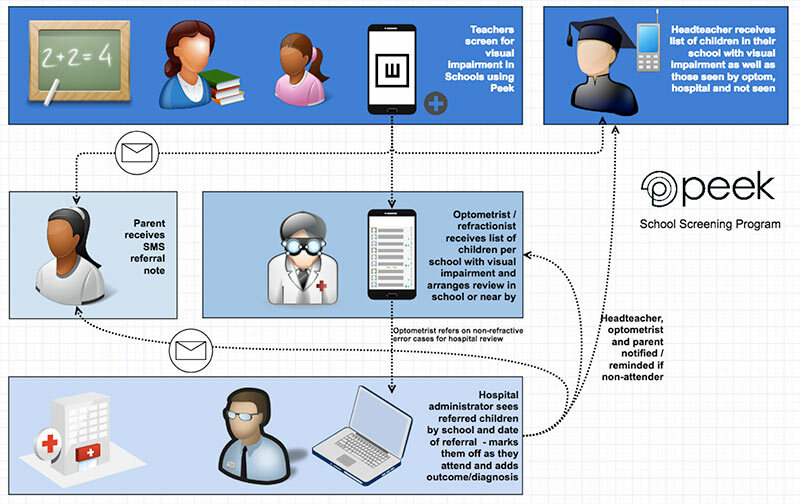 It is integrated with software that tracks children as they move through each stage in the comprehensive school eye health programme (Figure 3). It can, for example, automatically create a referral for children who have failed screening or have been identified as needing more specialist care, and communicate this to staff at the base hospital or vision centre. 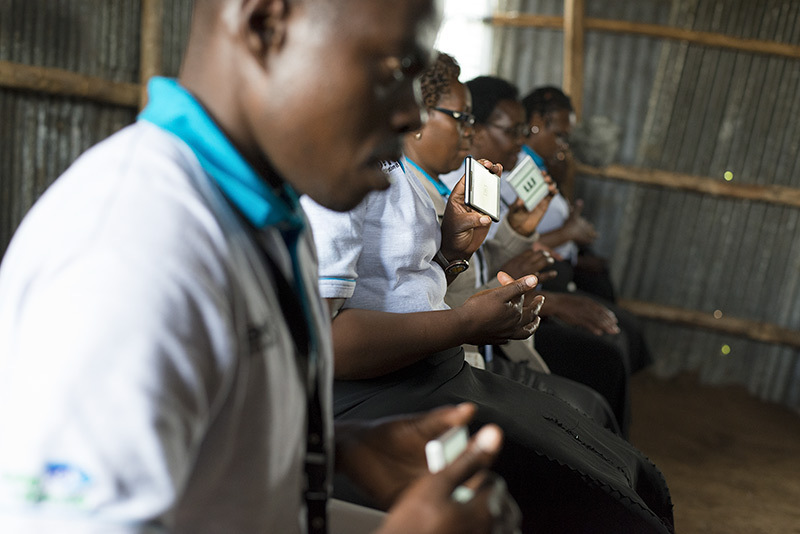 The system is also able to capture parents’ mobile numbers so they can be kept informed and also receive reminders of follow-up appointments, etc. The software allows children to be tracked at each stage in the process, and generates data that can be used to monitor the programme in real-time, identifying bottlenecks early in the process. Table 2 summarises how management information system software can be of benefit to programme managers as well as children and their families.